Build in about 1437, the Manor house, was reconstructed in approximately 1734 during the Baroque times under the supervision of the Basel de Rosey Family. This Estate was also known by the peasants as the beautiful “The Castle”, and was the center of social and economics life of the village. Even in Fontane hikes, through the Brandenburg trails, there are references that this Estate was from an aristocratic, social and wealthy being but yet known as a moderate Estate within the Region. After several changes of ownership, and through the early post war years, it’s still remained a piece of Jewel and history among the locals of the old Village “Schönwalde”. Only during the SED dictatorship in the 60 th, the castle was stripped of his beauty: The roof was ripped and replaced by asbestos cement, the “Castle” was disemboweled and transformed as a storage room for grain. The whole structure was neglected to a state of disintegration. The first tenant, who wanted to invest in the Estate for Tourism purposes, failed due to the amount of comprehensive reconstruction needed for the project. In November 2006, a big part of the new re-constructed stables was destroyed in a fire that was set by suspected arsonists. Since 2007, the new tenant, Dr. Inge Schwenger, in association with the local community, district and region have developed a new concept of an equestrian and tourism center, as a focal point for cyclists and cultural enthusiast. In 2011, the approved development plan was finally at hand, and the construction of a new gastronomy and guesthouse would begin. The grand opening was in September 2012 and offers a rustic elegant cuisine as well as 4 distinctive lodgings for groups, couples and individuals traveling alone. 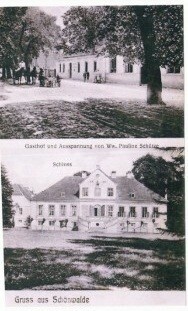 Accompany us through the following pages, and let us share our accomplishment in making this “castle” Schlossgut Schönwalde again a place of comfort, relaxation, where your soul can re generate and reform.